It currently supports the four major instant messenger networks : MSN Messenger, Yahoo! Messenger, AIM and ICQ. You’ll be able to chat with friends, customers, co-workers, family, and anyone else you want to! Transfer files quickly and more reliably than with official MSN or Yahoo clients! 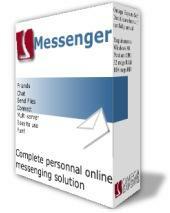 By downloading the Omega Messenger you accept its terms and its conditions.